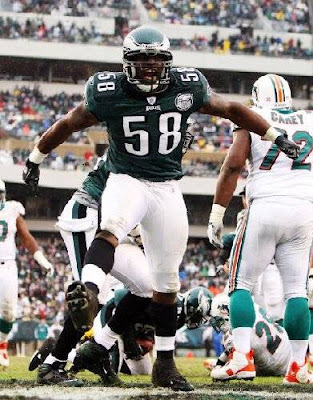 Today, Pro Bowl defensive end Trent Cole was listed as day to day with a mild ankle sprain after an MRI (taken Saturday morning) revealed no structural damage. "Well I'm good nothing serious. Time to recover and get after Green Bay," said Cole on his twitter account. On Friday night, Cole left the Eagles preseason game against the Kansas City Chiefs in the second quarter, when he had his foot stepped on by an offensive lineman. Cole did not return to the field with what Head Coach Andy Reid called an ankle sprain. X-rays were taken during the game and showed no breaks in his ankle. The news could not be any better for the Philadelphia Eagles as they dodge a huge bullet. Cole is the type of player that can change an entire game with just his mere presence on the field. He takes every snap at right defensive end and makes offensive coordinators game plan around him his skills. Additionally, Cole numbers should improve this year with first-round DE Brandon Graham lining up at left defensive end. Still, the Eagles are not completely out of the woods yet. His ankle sprain is going to take some time to heal and playing on it could also agitate it. In addition, ankle sprains are a nagging type of injury that can affect a player for a good portion of the season. Nevertheless, just having Cole on the field is a huge benefit for the Eagles defense and Defensive Coordinator Sean McDermott. The Eagles will likely rest Cole over the next two weeks in hopes he will be at 100 percent for the Packers in week one.